Incorporated in 1987, Taylor Studwelding Systems Ltd have many years of experience in the supply of Taylor Stud Welding products into many and diverse industries. They have developed a quality line of Stud Welding equipment from simple hand weld units, through to CNC fully automated systems. Taylor Stud Welding Systems Limited with over 35 years in the industry has developed its position as the UK’s leading supplier, designer and manufacturer of Studwelding equipment. 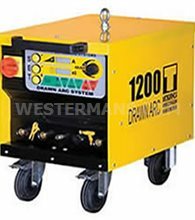 Buying from Westermans gives you a choice of a New or Pre-Used Taylor Stud welding machine. Used welding equipment is an affordable option with a warranty period. 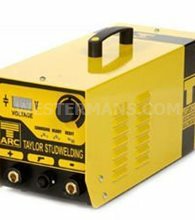 Incorporated in 1987, Taylor Studwelding Systems Ltd have many years of experience in the supply of Studwelding products into many and diverse industries. They have developed a quality line of Stud Welding equipment from simple hand weld units, through to CNC fully automated systems. Stud welding is a form of spot welding where a bolt or specially formed nut is welded onto another metal part. The bolts may be automatically fed into the spot welder. Weld nuts generally have a flange with small nubs that melt to form the weld. Studs have a necked down, un-threaded area for the same purpose. Weld studs are used in stud welding systems. It disintegrates when the trigger is pulled on the gun. When the tip disintegrates, it melts and helps solidify the weld to the base material. Arc studs range from a #8 to 11⁄4" diameter. The lengths are variable from 3/8" to 60" (for deformed bars). Arc studs are typically loaded with an aluminum flux ball on the weld end which aids in the welding process. Stud welding, also known as stud arc welding, joins a stud and another piece of metal together. The stud is usually joined to a flat plate by using the stud as one of the electrodes. The polarity used in stud welding depends on the type of metal being used. Welding aluminum, for example, would usually require direct-current electrode positive (DCEP). Welding steel would require direct-current electrode negative (DCEN). Stud welding uses a type of flux called a ferrule, a ceramic ring which concentrates the heat generated, prevents oxidation and retains the molten metal in the weld zone. The ferrule is broken off of the fastener after the weld is completed. 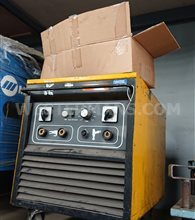 Portable stud welding machines are available. Welders can also be automated, with controls for arcing and applying pressure. Stud welding is very versatile. Typical applications include automobile bodies, electrical panels, shipbuilding and building construction. Shipbuilding is one of the oldest uses of stud welding. Stud welding revolutionized the shipbuilding industry. All other manufacturing industries can also use stud welding for a variety of purposes. A type of stud welding called capacitor-discharge (CD) stud welding differs from regular stud welding in that capacitor-discharge welding does not require flux. The weld time is shorter, enabling the weld to bond with little oxidation and no need for heat concentration. 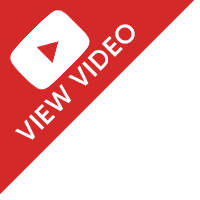 This process uses a direct-current arc from a capacitor. The weld time in this process is between 1 and 6 milliseconds. Capacitor discharge stud welding with the latest equipment can create a weld without burn through showing on the opposite side of very thin metals. CD stud welding is often used for smaller diameter studs and pins, as well as on non-standard materials and for accuracy. On the other hand, arc stud welding is primarily for structural purposes and larger diameter weld studs. These are three different types of studwelding methods in everyday use with Nelson Studwelding systems. From simple hand held units right through to C.N.C. fully automated systems, TAYLOR Studwelding Systems can provide turnkey solutions to your studwelding requirement. 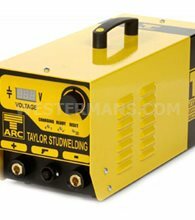 TAYLOR Studwelding equipment offers you complete versatility. Control and Security Equipment, Mechanical Instruments, Office Automation, Data Transmission, Communications, Test Equipment. Domestic and Industrial Boilers, Air Conditioning and Ventilation Units, Refrigeration Systems. Catering and Food Processing, Insulation and Fireproofing. Mounting components on panels and in cabinets. Earthing components. Bonding doors and panels. Fixing fascia panels. Mounting switches, push buttons and instruments. Mounted printed circuit boards. Fixing cover plates and maintenance inspection hatches. Attaching machinery guards. Fixing fluid and air lines. Mounting handles and other components. Attaching flanges, covers and hatches. Mounting fluid chambers. Fixing burners and heating elements. Securing pipes and insulating material. Fixing of signs, plates, panels and badges. Attaching pins, findings and clasps to jewellery. Attaching feet to kettles and handles to pans. Hygienic fixing of legs, brackets and stiffener strips to counter and table tops. 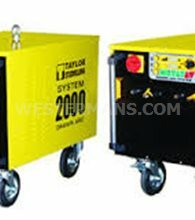 Sell your Taylor Stud welder. 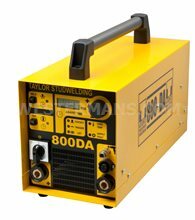 We want to buy more Taylor Stud welding equipment. 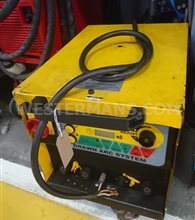 Complete our Wanted Form with details of any used welding machinery you have surplus and for sale.